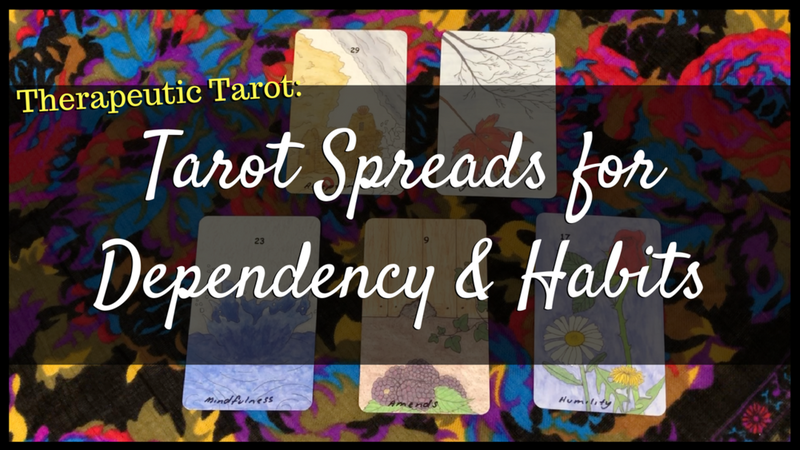 In today's Therapeutic Tarot, I am sharing with you 3 tarot or oracle spreads that I use to confront and manage my addictive tendencies and destructive habits. In this series, I share activities and exercises that have helped me in recovery and maintaining my mental health. I am not a professional, and this series is not designed to replace any professional help you may need. Please take care of yourself. This first spread is a great place to start if you are feeling that your habits or behaviours have become unhealthy. What does it take from me? What is something I can do today? Spread number two is for those times when you 'fall off the wagon', whatever that means to you. Our aim here is to work out what happened, and to consider how we can get back on track without beating ourselves up too much. Why did I fall off the wagon? How can I be/do better next time? How can I be firm/kind to myself right now? This is a sweet and simple spread that can be done regularly to check-in with your current state, to give yourself a pat on the back and also look to what can be improved.